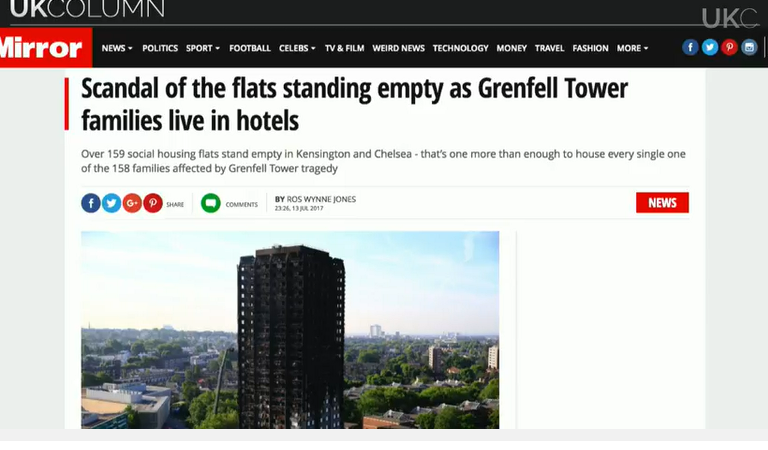 "Residents are demanding that the public inquiry into the Grenfell Tower fire increases its scope to include the regeneration programme ," Mike Robinson informs viewers on UK Column News on Friday 14 July 2017... Mike asks Brian Gerrish for his thoughts on whether the inquiry should increase its scope. "Well I would say it should ... Mike, because the experience of a lot of people here in Plymouth and other cities across the UK has been that where these government created regeneration programmes have been put in place we have seen a ... transformation in the way that local authorities behave. They`ve become very aggressive... So we`ve had reports and dialogue with members of the community across the country: Sheffield, Newcastle, Glasgow, London. Anywhere these major regeneration programmes have been put in place there`s been a step change in the behaviour of local authorities and inevitably they`ve become very domineering ... and the party politics, the vision for the future, is the primary goal; people`s real interest, second place." "So we are keen to understand why residents` concerns have been systematically ignored, as they describe it.... just to reinforce that, something we`ve seen right across the country..."
"It`s right across the country and it doesn`t matter what the subject is - the subject could be safety on the streets - it could be the crime rate - whatever it is that local people are genuinely experiencing and concerned about, they are not going to have a proper dialogue with the local authorities because the local authorities have been changed into political fiefdoms." Mike takes up the discussion again: "Well the Mirror here...: Scandal of the flats standing empty as Grenfell Tower families live in hotels. And this is 159 social housing flats which have been identified in the Kensington and Chelsea area and the council says `We are continuing to make good progress on rehousing during a complicated process involving severely traumatised people`. So far 167 first offers have been made, 25 offers have been accepted, 8 households have been rehoused. That`s 8 households so far have been rehoused. But the point here is that there`s 159 empty flats from the Sutton estate but of course these flats are boarded up. They`re derelict at the moment. 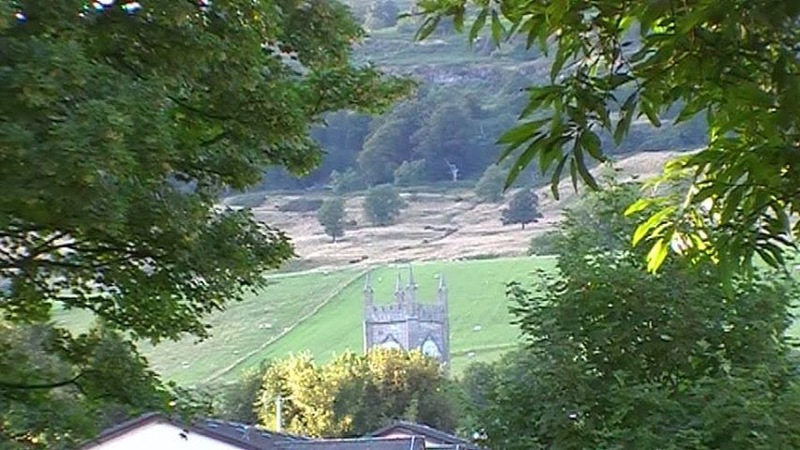 There`s no sign of those being refurbished at this stage. The housing association is called Clarion - it was originally called Affinity Sutton - and they have offered a number of flats on another part of the estate but they`re saying the tenants would have to carry out repairs at their own cost. So residents are saying they`re shocked and appalled that this is going on." "Well Mike this is one of the key areas and of course this is a con carried out by the government. But when they started to get rid of council houses - council houses had a mixed reputation across the country. Some of them were built to quite good standard; some of them were very poor indeed; but the key thing about a council house is that once people have been on the list and they`ve secured the council house it was theirs for life. It stayed in the family. If there were children they might end up living with mum and dad; they might end up with grandma and grandad living with the family. Then what the government did: `No no. 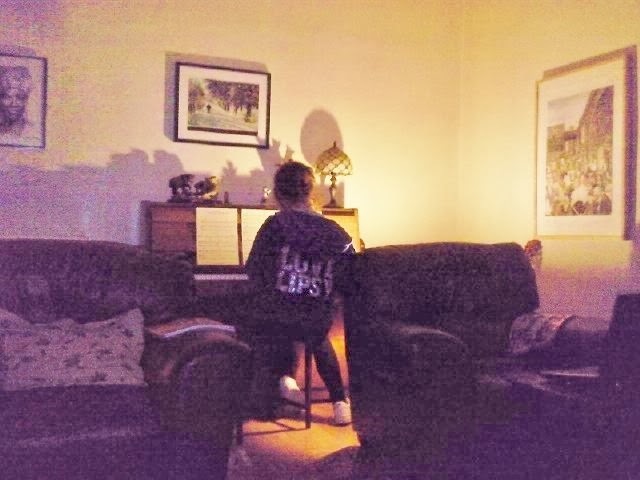 We`ve got to improve these things; we`ll give you an updated kitchen or an updated bathroom.` There was a bribe element to this and these updates were then used to bring in the housing associations and what the housing associations were was a `for profit system`. They say they`re not `for profit` but they are in fact a `for profit system` and with the housing associations came the removal of secure accommodation for life. So as the housing associations have come in: who are they accountable to? It`s not really clear because invariably they have the local council on their board but they`re private organisations with a public sector input. It`s very confusing but these housing associations have become increasingly dictatorial in telling residents what they can and cannot do if they are to remain living in one of their properties." Mike refers to an article in GetWestLondon: "West London colleges merger plan will benefit students and staff. So regeneration at the heart of all this... Now this is interesting because it involves Wornington College which is part of Kensington & Chelsea College. So Ealing Hammersmith and West London College and Kensington & Chelsea College are going to merge. They say this is a move that is going to benefit everybody. Now Ealing Hammersmith and West London College has four sites and Kensington and Chelsea College has two sites and as I say one of those is Wornington College. 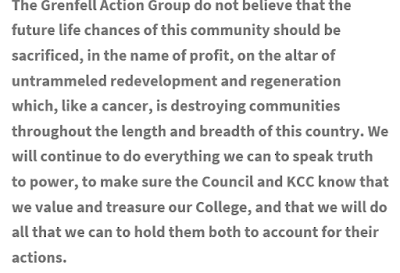 Now this article in GetWestLondon makes a statement that under the move both colleges will retain their existing sites and names and this is very confusing, Brian, because Kensington and Chelsea council right at the time that people are obviously upset about what is going on with Grenfell have decided that it`s time to knock down Wornington College... and to regenerate it." "So what they did without so much as a by-your-leave, without asking anybody for their opinions in April last year, they bought the building for regeneration. They`re going to turn it into flats apparently. But they say they`re still going to accommodate the college but this college is something that local people rely on absolutely. It`s something that helps people - anything from learning English as a foreign language to getting people up to a standard to enter degree level courses around the country. 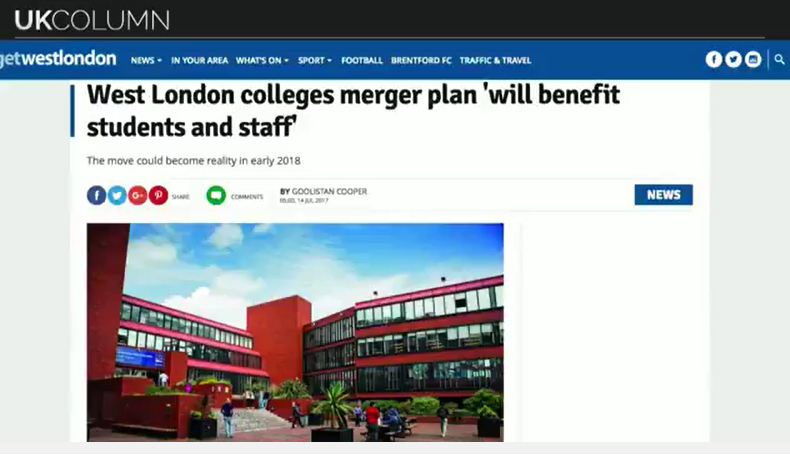 So the local community appreciates this and they are concerned at the moment that this college is going to disappear as a result of this deal. They don`t really understand why the deal`s happened and there is a campaign group if anybody`s interested. It`s called the Save Wornington College campaign. You`ll find it on Facebook. Do go and have a look. 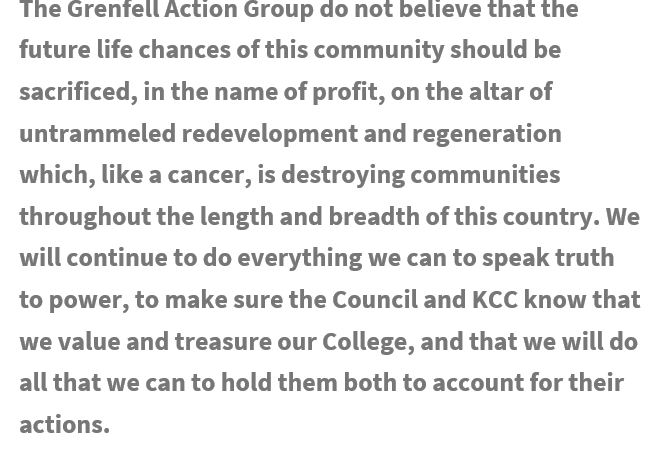 But the key point here is, you know, a community that is already suffering the effects of regeneration continues to suffer and, of course, some people might take the view `Well hold on, they`re wanting to knock down the old building and replace it with a new building. Why would you complain about that?` Well for the same reason that when they knock down many of these social housing buildings and replace them, they replace them with fewer homes than were there originally." "And they`re too expensive for local people to afford." "Exactly. So people are extremely sceptical about whether this is going to turn out as promised." "Well I`ll just add to that Mike that I believe what is going on here is Big Society at work. Big Society, which is never mentioned in the mainstream press and media at the moment, it is definitely there. It is being built and of course in Big Society the state is to control everything. It`s to control industry; it`s to control housing, education and of course we can see that the NHS is being privatised at the moment. It`s very nearly there and so we`ve seen the destruction of local communities across the board, whether they are community centres, or homes for the elderly, they go. Local libraries are going; local education facilities are going; and what`s invariably replacing them is always something that is bigger and shinier but if you look at what the control is, it`s really based on... profit." "Interesting that you mentioned the library because Kensington and Chelsea have decided to close the library in the area and install a private school into that building." "Libraries are being decimated across the country. Many people say that ... of course , if we end up with a system of knowledge based on the internet and electronic forms that information can be changed overnight." "Well let`s bring David Scott in at this point because, David, Grenfell Tower insulation was not certified for use with flammable cladding, according to the Guardian. The mainstream media continuing to flail around on this issue." "Yes, and it`s very striking ... some of this we covered on 15 June 2017 and we`ve covered in articles since and now cropping up belatedly in papers like the Guardian and on the BBC. "